The drone of the vuvuzela, that ear-piercingly annoying plastic horn, has tempered the excitement of this year’s World Cup matches. Here’s a fairly easy fix that just might snip the vuvuzela out of your life. This year’s World Cup got off to an exciting start, at least for my native USA (we totally didn’t lose!). But all the fun of watching a Cup match is tempered by that grating, stab-your-ears-with-a-pencil drone of the vuvuzela, that giant red plastic horn. The vuvuzela’s drone seems stronger this year than ever before, and there have been a few offered fixes to the problem. The best way to filter out the vuvuzela is through equalizer settings. 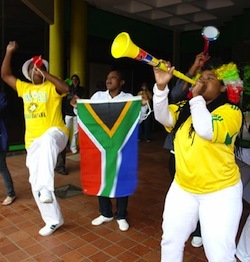 The vuvuzela’s tone is a Bb, which in an EQ translates to a primary tone at 233Hz and secondary harmonic tones at 466Hz, 932Hz, and 1864Hz. Since we’re not concerned with getting the full spectrum of sound (this isn’t music–we’re just trying to get field noise and announcers), you can safely eliminate those bands and still enjoy the game–hopefully sans vuvuzela. PopSci shows off a DIY software filter that you plug into your TV to get rid of the offending bands, and Book of Joe shows that certain TVs have a custom EQ built in. But really, this should extend to any decent stereo, which should have some sort of EQ. All you have to do is lower those specific bands to zero, and the tone of the vuvuzela should be scaled way down as well. You can also crank the other bands higher for a more dramatic change, if it doesn’t seem to be working. If you don’t have those specific bands on your EQ (it has to be a pretty detailed EQ to have 233Hz–mine skips right from 125Hz to 250Hz), you might be out of luck. But many newer digital amplifiers and receivers have that sort of detailed equalizer, and it’s certainly worth a try. Give it a try and tell us if it works!